I chatted with co-designer Dan Dillon about his work bringing Courts of the Shadow Fey to 5th Edition, and naturally, we ended up talking about Midgard-in-general quite a bit too. Lou: So this is a 4th Edition product—that was quite celebrated when it came out—now updated and significantly expanded for 5th Edition. What were some of the major changes in this version? Dan: Yep, originally 4E, though it went through a conversion to Pathfinder Roleplaying Game as well, and that was the version I worked with primarily. Overall, the structure of the adventure is unchanged. Obviously, individual elements like magic items and ability checks are all worked through the 5E lens. Some of the individual encounters have been sanded and tweaked to make them run more smoothly. There were some things that worked okay in previous editions but weren’t quite right for 5E and also a few places where already being converted from 4E to Pathfinder left some seams showing. Narratively, there are updates that reflect the newer version of Midgard as presented in the Midgard Worldbook. As a quick example, there’s a bearfolk ambassador from the Moonlit Glades at the courts proper, added to the roster of over a hundred NPCs there. Lou: I love the bearfolk ambassador! We have a bearfolk in our current campaign, and I can’t wait for him to meet the ones in the Shadow Realm. Speaking of, let’s talk about the shadow fey. My understanding is that they’re not “really” fey because they are elves that have migrated into the Shadow Realm. It’s a bit like Celtic mythology where the Tuatha de Danann came from elsewhere (probably Norway). At first, they were a people, and then they were heroes and even gods of a sort, and then they moved into the fairy realm and became the sidhe (though other fae lived there already). Dan: That’s very much the kind of evolution you’re looking at with Midgard’s elves. They originally come from the Bright Lands, a place or plane not well understood by anyone. When their Midgard empire fell into decline, the vast majority of them left and fled back to their home, and they closed the fae roads behind them. The shadow fey were elves who didn’t stay behind on Midgard but also didn’t return to the Bright Lands. They fled into shadow and made pacts with Sarastra, the Queen of Night and Magic. They took the darkness of the Shadow Realm into themselves and were changed by it. They’re not fey creature type; they are still elves, but they are creatures of the Shadow Realm. They’re masters of shadow and illumination (starlight) magic and one of the few who understand the secrets of living and thriving among shadow without being completely consumed by it. The 5E takes on eladrin and shadar-kai as elf subraces are similar concepts in many ways. Dan: Kari, our shadow fey PC in Season 1 of World Tree (and yeah, the “As” creeps in there a lot, you aren’t alone), isn’t a courtier. There are many shadow fey from many places outside the courts proper. There are villages, entire cities, wilderness outposts of shadow fey, all of whom would be entirely out of their element if thrust into the Courts of the Shadow Fey. Kari spent most of her formative years loosely affiliated with the forest hunters in the Sable Court, a minor vassal holding in the forests a good ways from the Shadow Court itself. The elves have always been here, mostly in the Arbonesse forest, but at the current point of time glimpsed in the Worldbook, they are returning. No one quite understands why. Lou: Ooo… now I want a Sable Court one shot. That’s the problem with Midgard. 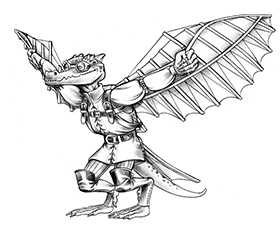 I’m so captivated by the lore, I have to have every product, and not just each one Kobold puts out, but each one I can imagine them putting out. Dan: Oh, I feel that one big time. I’m pining hard for a planar supplement at the moment. I keep it in mind, though, when I decide who the players are interacting with and running into. Elfmarked NPCs are rare, and currently nearing the end of Season 2 of our campaign, the only other elves they’ve seen were in Kari’s backstory, in the shadow fey embassy in Zobeck, or a dead body in the Margreve. Lou: I get that. Just reading through the populations of the Arbonesse, you see how small the percentage of elves in Midgard is. Dan: And there are the windrunner elves on the Rothenian Plain, but again, they’re a small population and mostly keep to themselves. Lou: So 7th level is a long time to wait. What can a GM do to begin sowing seeds for Courts? I’ll probably run Wrath of the River King before this—and the king makes an appearance in Courts, doesn’t he? Dan: The River King himself doesn’t make an appearance, but there are three representatives of his River Court in attendance. They are potential allies that visitors from Midgard might find among the convolution of shadow fey politics. Though they come with their own pitfalls. Looking forward, I’d say seeding information about the history of Zobeck itself, particularly its liberation during the revolt that overthrew House Stross, is an important foundation piece. Learning about the Stross family’s connection to shadow magic and possibly to their pacts with the powers of shadow directly—that’ll help set the stage for the fey pressing their claim over the city later. There are several merchant concerns that travel to and do business with the shadow fey, so maybe an early adventure that has the characters interact with shadow fey merchants or traveling guards from such a caravan. Lou: I think Wrath, Courts, and (finally!!) Return to Castle Shadowcrag would make for a hell of a campaign. Dan: Oh yeah, they’d be a great look at different angles of power exerted over Midgard. Dan: Yes, indeed! Wolfgang and I both contributed some fun bits to The Faerie Ring. Great resource for expanding the scope of powerful fey beings. Dan: Oh, most definitely. You can easily port this to any D&D world as a faerie court in the Shadowfell. Change a few names, maybe swap out the shadow corruption rules for the Shadowfell despair from the DMG, and boom, you’re good. If you wanted to go hard on it, you could even replace or add in shadar kai as well. Lou: That’s actually germane to my next question—which is, what do you think is unique about Midgard? For me, it’s a tone more than anything else. Dan: Yeah, tone is the big one. The way certain things are handled, like deities. Gods in Midgard are closer to those presented in mythology. The stories from one region don’t necessarily match with tales of the same god from another, yet both sects of followers seem to be entirely empowered by divine might. Who’s correct? Could be both. I love the concept of divine masks. It keeps an extra layer of mystery between the characters and the gods. And the idea of magic having these mysterious, powerful, but dangerous aspects, represented by the concept of deep magic that characters can choose to seek out and study. Lou: Yes to all that! Though for me, it’s the way it tracks real world mythology. Somehow, it makes the setting feel both more mysterious and fantastical and at the same time more credible than other settings. It’s hard to think sometimes that Midgard isn’t a real place that we might stumble into if we accidentally trip through a door into a ley line or follow the wrong cat down a cat slide alley. Dan: That’s the goal of any world builder, to have people getting lost in the idea of the world on a moment-to-moment basis. I also like that Midgard has this looming threat of war or conflict on every side. In Midgard, nations and city states might erupt into hostilities at any time. Lou: Yes, exactly. Sometimes other settings start to feel to me like a land of Anarcho-Syndicalist Communes. I like the presence of nations with all of their rivalries and complex interactions. Dan: Wolfgang refers to that as “piling gunpowder.” We make sure there are a few gunpowder piles on every page, and it’s up to the individual GMs and players to decide where to drop a match. Dan: Though one of my favorite things is a relatively simple inclusion. The final encounter of the adventure involves an NPC asking some interesting questions, some of which are all implication and don’t have actual answers. I wanted to pin down one of those answers, which Wolfgang let me do, and that ended up being a massive Midgard world secret revealed in Courts that the players might stumble across. I’m excited at the potential adventure that one simple question represents. Lou: Yes, I am excited about that! And everything in Courts. Thank you, my friend! 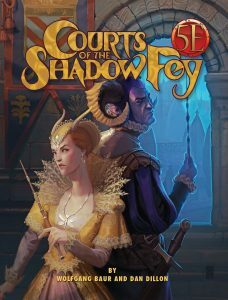 Pre-order your copy of Courts of the Shadow Fey today!